This square disposable tableware is perfect for bridal showers, Bat Mitzvahs, garden parties, barbecues, weddings, or any outdoor event. 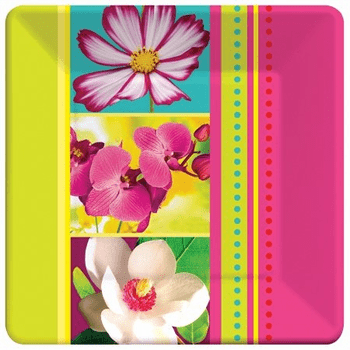 The large plates feature three different beautiful island-inspired flowers on a background of pink and green. The coordinating small plates, cups,and napkins each display one of these flowers for a creative look. Island Flowers 10" Square Floral Paper Banquet Plates 8ct. Island Flowers Floral Guest Towels 16ct. Island Flowers 9oz. Floral Hot / Cold Paper Cups 8ct.